If the phone rings and you think the person on the other end of the line is an imposter, you’re probably right. The Federal Trade Commission just issued a report stating that in 2018, for the first time, imposter scams topped its list of consumer complaints. Such scams, which include those from fraudsters claiming to be from the IRS, the Social Security Administration, and other government agencies, try to get people to turn over personal information as well as money, says Monica Vaca, associate director of the Federal Trade Commission’s Division of Consumer Response and Operations. Stung by the IRS on Your 2018 Taxes? Here's How to Fix It. 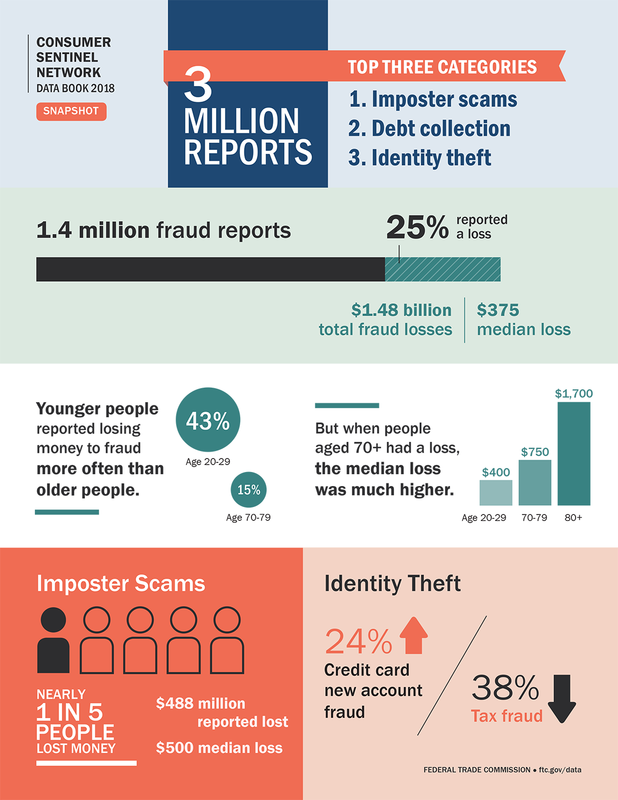 According to the report, consumers said they lost nearly $488 million to imposter scams in 2018. The median lost per consumer was about $500. All told, consumers reported losing nearly $1.48 billion to fraud, an increase of $406 million from one year ago. That included money lost to fraudsters claiming to call from debt collection agencies and from scammers who stole the identities of consumers. There was some good news, though. The number of imposters that stole a person’s tax refund fell by about 38 percent from one year earlier. But don’t let that make you less careful. With tax season now here, the Internal Revenue Service says it pays to be aware of scams that could target your money or identity. Kathy Pickering, executive director of The Tax Institute at H&R Block, also says that such scams could easily become more common. “Fraudsters are adaptive,” she says. Here are two kinds of tax scams you should be aware of and advice on how to protect yourself. You get a phone call from a scammer claiming to be with the Department of Justice but working with the IRS. The person tells you he is calling because you haven’t paid your taxes. Or you may get an email that looks like a bill for unpaid taxes in connection with the Affordable Care Act or an email that appears to come from the IRS Taxpayer Advocacy Panel telling you that it is sending you a refund. In both cases, the emails ask for your Social Security number and a bank account number to confirm your identity. If you hand over your Social Security number, crooks will attempt to use it along with other ID information to create fake tax returns in order to steal any refund you may be due. In this scam, you get a phone call from someone posing as an official from the IRS or a local law enforcement agency. The person tells you that you have an unpaid tax bill and threatens you with arrest, deportation, suspension of your driver’s license or business license, or some other penalty unless you pay your bill immediately. He tells you to pay using your debit card (so the money is immediately withdrawn from your bank account), using a gift card, or by making a wire transfer. The caller may even “spoof” the caller ID information that appears on your phone, so it appears that the call is coming from a government agency. In another phone-related scam, a fake IRS official calls students and tells them that they owe a “federal student tax”—a tax that doesn’t even exist. The caller tells the student he will be arrested unless he immediately wires his payment. If you get a phone call threatening you with arrest or asking for your Social Security number, hang up, Vaca says. The IRS will never call you to demand immediate payment, and it will never threaten to arrest you for unpaid taxes. Ignore such emails as well. Also, don’t accept specific payment instructions. The IRS offers many payment methods, and you can choose the one you want. The IRS also suggests that you take the following steps to protect yourself from tax fraud. File early. That way, if crooks get ahold of your Social Security number, they won’t be able to use it to file a phony tax return and claim your refund—you’ll already have done that. Use security software. Be sure you have an up-to-date antivirus security program and a firewall installed on your computer or any device you’re using to access sensitive documents or the IRS website. But also be on guard if someone calls you unexpectedly or you receive an email with a link to a software update. It could be from a scammer trying to trick you into downloading a data-stealing computer virus. Protect your personal information. Don’t routinely carry your Social Security card or leave sensitive information lying around. If you must provide your important data online, such as your Social Security number or a password—for example, on a banking website—verify that you’re on a legitimate site and not a phished one made to look like the real thing. Make sure your tax records are in a secure place. Contact the IRS if you think you’ve been scammed. Report the scam to the Treasury Inspector General for Tax Administration. The phone number is 800-366-4484. You should also forward any emails that you think come from scammers to phishing@irs.gov. Also, contact the IRS Identity Protection Specialized Unit if you believe someone has used your personal information to file a tax return or steal your identity. The phone number is 800-908-4490.